Your budding chefs will love getting stuck in in the kitchen with these vibrant fish and veggie couscous parcels. Put a baking tray in the oven and preheat the oven to gas 6, 200°C, fan 180°C. Put the couscous in a bowl and cover with the hot stock. Set aside for 5 minutes until the stock is absorbed. Meanwhile, mix the lime juice and honey in a small bowl. 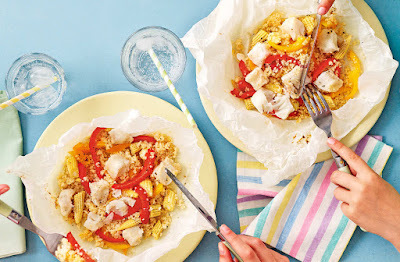 Lay out 4 x 40cm squares of nonstick baking paper and spoon the couscous into the middle of the paper squares, then arrange the vegetables and fish on top. Drizzle over the lime-honey mix. Scrunch the parcels together to seal. Put the parcels on the tray and cook for 20 minutes. Transfer each parcel to a plate to serve. Open them carefully, allowing the steam to escape first. Tip: Roll your limes on the work surface with the palm of your hand before cutting and squeezing to get maximum juice!